Don’t panic though; I’m here to help. 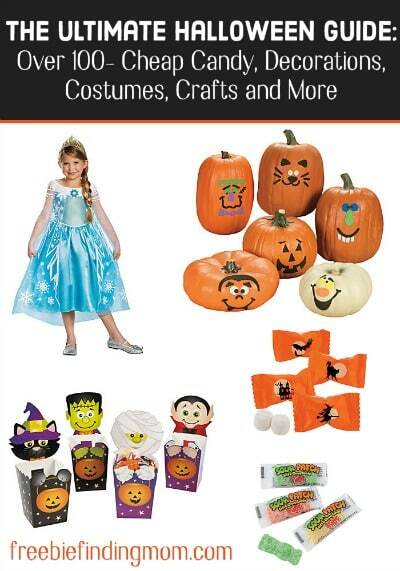 I’ve put together the ultimate Halloween guide which will help you find great deals on bulk Halloween candy, decorations, costumes, crafts, and more! Don’t forget to follow Freebie Finding Mom on Pinterest to stay up to date on the latest fun kids’ activities, crafts, recipes, DIY projects, money saving tips and more! Let’s start with a very important aspect of Halloween: Candy. Now, if you live in the middle of nowhere on some dark country road this may not be important to your Halloween celebration but most of us will have to contend with adorable children demanding sweets. That’s where bulk Halloween candy comes in. Buying bulk Halloween candy is a great way to appease trick or treaters but still stay on a budget. 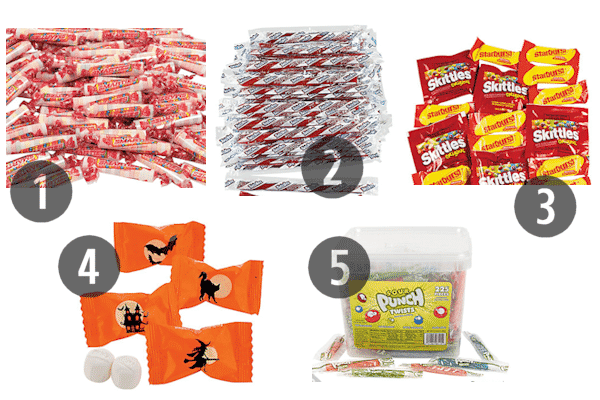 (Here are more tips on how to score cheap (or even free) Halloween candy). At this point, you may be wondering why you need a “guide” to bulk Halloween candy. After all, isn’t it everywhere right now? Yep, it is, and that’s precisely why you need a guide to help you select your bulk Halloween candy. Just because bulk Halloween candy is on every store shelf at the moment doesn’t mean you’re getting a good deal. I’m here to make sure you find the best bulk Halloween candy at the best prices. There’s not a lot of time, so let’s get started! First off, you can never go wrong with an assortment of bulk Halloween candy. Check out this 9 pound bag of bulk Halloween candy from Oriental Trading. You get 1,000 pieces of candy for just $45.00. Tip: Be sure to hide this from your own children! 1. Smarties Roll Candies – This bulk Halloween candy is a true classic. Plus it’s a little less messy than chocolate. 2. Twizzlers Licorice – This strawberry flavored bulk Halloween candy is sure to be a hit. Just try not to eat them all yourself before the big day! 3. Big TimeSkittles & Starburst Fun Packs – Taste the rainbow…and more with the bulk Halloween candy pack filled with Skittles and Starbursts. 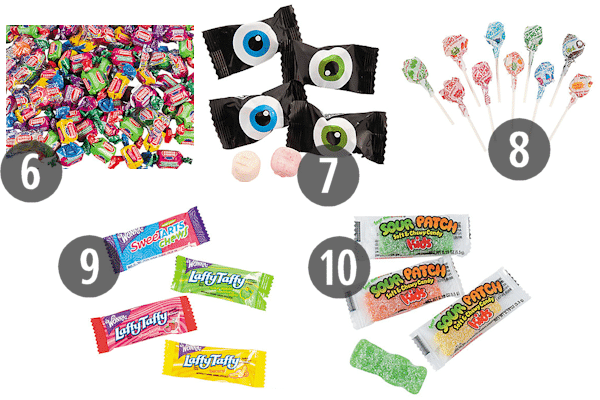 You get over 2 pounds of candy for just $16.00. 4. Silhouette Halloween Party Buttermints – Looking for a different treat this year? If you want to give away an uncommon treat consider this bulk Halloween candy. 5. Sour Punch Licorice Twists – Forget sweets…go sour with this bulk Halloween candy. This bag contains a variety of flavors like “Chargin’ Cherry” and “Strikin’ Strawberry”. 6. Dubble Bubble Favorites Mix – For older kids (who won’t play with gum and get it stuck in their hair) consider this bulk Halloween candy. At less than 8 cents a piece this is a real bargain! 7. Eyeball Sweet Creams – Here’s a fun bulk Halloween candy you probably won’t find in your local store. With this sweet treat, all eyes will be on you! 8. Dum Dum Pops – Suckers are a great bulk Halloween candy for trick or treaters of any age. Plus, these are fat free. 9. Wonka Mega Chewy Favorites – This bulk Halloween candy is sure to give a trick or treater’s mouth a workout. In fact, he or she may still be chewing on this taffy at Thanksgiving! 10. Sour Patch Kids Candy Packs – You may want to give a piece of this bulk Halloween candy to your own little monster…the faces he or she will make while chewing on this sour surprise will be priceless. Tip: Have your camera ready! 11. Tootsie Roll Mega Mix – This bulk Halloween candy is a classic for a reason. Plus, it’s perfect for children with dietary restrictions because it’s peanut free and gluten free. 12. Hershey’s All Time Greats Mix – This bulk Halloween candy bag contains Reese’s Peanut Butter Cups, KitKats, Hershey’s Milk Chocolate bars, and Whoppers. You may have to hide this from yourself! 13. Bulk Pixy Stix – At around 5 cents a piece, it doesn’t get much better than this bulk Halloween candy. Neighborhood trick or treaters will be happy and so will your wallet. 14. 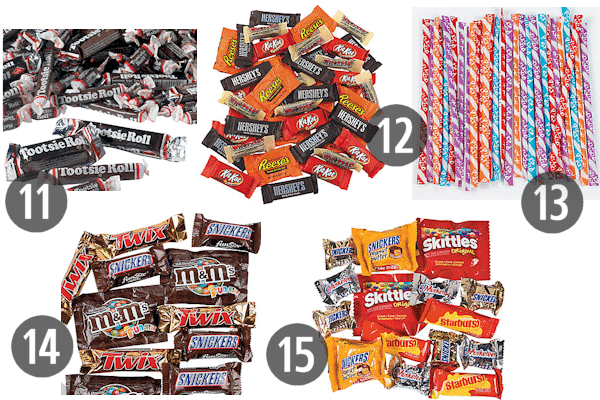 M&M Mars Kids’ Favorites – Here’s another delicious assortment of bulk Halloween candy. This bag contains Twix bars, M&Ms, and Snickers. 15. Mars XXL Halloween Variety Pack – If you can’t decide which bulk Halloween candy to buy, consider this fun assortment. This package contains Snickers, Snickers Peanut Butter Squared, Starburst, Skittles, and 3 Musketeers. Now that we’ve got the bulk Halloween candy under control, let’s talk decor…. Sure, candy is important to Halloween but so is decor. 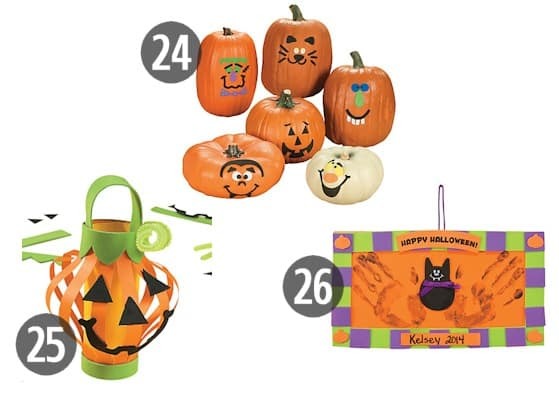 Get yourself and your family in the Halloween spirit by decorating inside and out! The great thing about Halloween decor is (unlike bulk Halloween candy) a little can go a long way. A few strategically placed decorations can transform your home into a haunted mansion (cue the organ music). 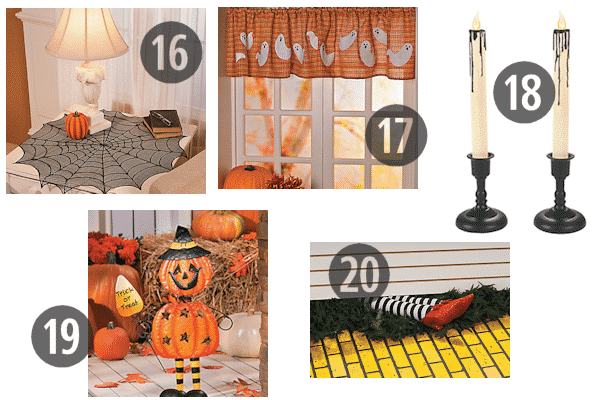 Here are some fearsome and frugal decor options. Plus, if you really want to save money and take on some super simple DIY Halloween crafts, check out these 25 free printable Halloween decorations. You may think you can’t have a Halloween party because of your tight budget (after all, Christmas is coming up!) but there are plenty of treats and tricks to make having a Halloween bash on a budget possible. For example, have a potluck Halloween party where each guest brings a dish. You can even direct them to Pinterest to find inspiration for horrifying Halloween concoctions. If it’s a kids’ party, you probably won’t need much food as the little ones will be too busy running around to eat. You can ask parents to bring a dish or opt for something simple like a frozen pizza. For dessert, consider this Halloween inspired kids cupcake idea for monster cupcakes. When it comes to tableware like plates, glasses, tablecloths, etc. you can save big bucks by shopping online. Simply be sure to allow enough time for shipping. Another way to get your family in the Halloween spirt is by indulging in a few crafts. Don’t worry, you do not need to be Martha Stewart to have fun with Halloween crafts. A traditional Halloween “craft” is carving a Jack-O-Lantern. While the little ones may not be able to help out much (due to the sharp objects involved), they can pick the pumpkin and pick the carving. Be forewarned, if you let them pick what you’re carving they’re sure to go with something intricate and complicated so it may be best to present two or three easy designs for their selection. 24. 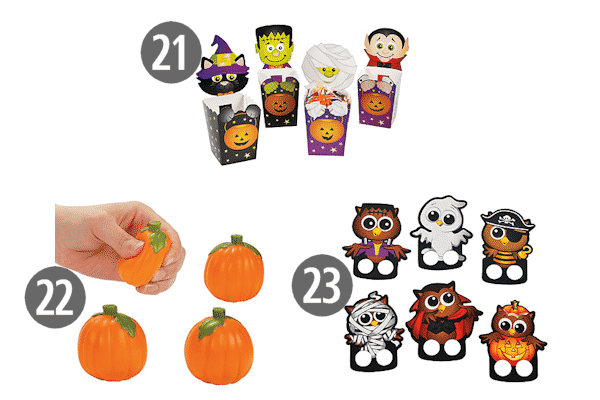 Pumpkin Decorating Kit – 48 pcs. You can also have a blast creating Halloween masks and hats with your kids. This can even be a fun activity for a child’s Halloween party. While not truly a “Halloween craft” you can also personalize these printable Halloween lunch box notes and put them in a child’s or spouse’s lunchbox to brighten their day and get them thinking about Halloween! Now, on to an important, somewhat complicated, and usually expensive aspect of Halloween: The Costume. 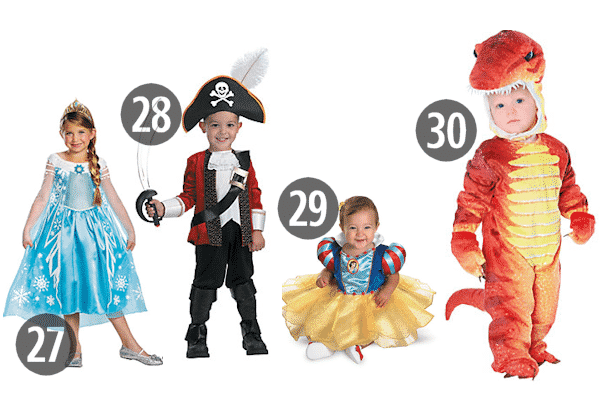 The problem with costumes is they cost a pretty penny and your child is only going to wear it for one year. Ouch! This year, save money on Halloween costumes by shopping online. Before you buy though, make sure the store allows you to return items (in case the costume doesn’t fit) and that you’ve allowed enough time for shipping. When shopping, don’t forget important costume accessories and costume makeup. If you’re going to need to be the makeup artist for your little one this Halloween, here are some great Halloween face painting ideas. There you have it, the ultimate guide to Halloween from bulk Halloween candy to Halloween costumes. Hopefully this will keep you from waking up and realizing the big day is tomorrow and you’re totally unprepared! Those last minute shopping trips can be costly. Whatever you do, have fun and have a Happy Halloween! Can you think of other things you need to get ready for Halloween? If so, please share them in the comments so I can add them to this guide! Oriental Trading is the best! When we used to have Halloween parties it was our go-to resource! Looking at this I wish we did more with Halloween in Australia, it is slowly gaining popularity here, but it has never been a big holiday…..I have a sweet tooth, so I wish it did!! I could buy all the lollies and that way if no one knocks on the door, I can keep it all for myself! !